Whitney Elizabeth Houston (August 9, 1963 - February 11, 2012) was an American singer, actress, producer, and model. In 2009, Guinness World Records cited her as the most awarded female act of all time. Houston is one of pop music's best-selling music artists of all-time, with an estimated 170-200 million records sold worldwide. She released seven studio albums and two soundtrack albums, all of which have diamond, multi-platinum, platinum or gold certification. Houston's crossover appeal on the popular music charts, as well as her prominence on MTV, starting with her video for "How Will I Know", influenced several African American women artists who follow in her footsteps. Houston is the only artist to chart seven consecutive No. 1 Billboard Hot 100 hits. She is the second artist behind Elton John and the only woman to have two number-one Billboard 200 Album awards (formerly "Top Pop Albums") on the Billboard magazine year-end charts. 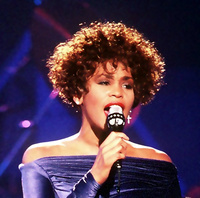 Houston's debut album, Whitney Houston (1985), became the best-selling debut album by a woman in history. Rolling Stone named it the best album of 1986, and ranked it at number 254 on the magazine's list of the 500 Greatest Albums of All Time. Her second studio album, Whitney (1987), became the first album by a woman to debut at number one on the Billboard 200 albums chart. This webpage uses material from the Wikipedia article "Whitney_Houston" and is licensed under the GNU Free Documentation License. Reality TV World is not responsible for any errors or omissions the Wikipedia article may contain.